This is a large recipe which can either serve 12 hungry people or be frozen for later use. 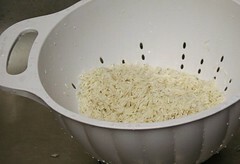 Soak rice overnight, then drain. 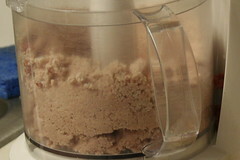 In a food processor, grind rice until it is the consistency of coarse sand. 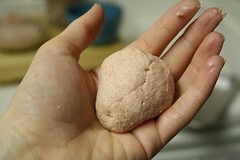 Continue to blend while adding ground beef, 1/2 cup at a time, until it is well mixed and starts to stick together. 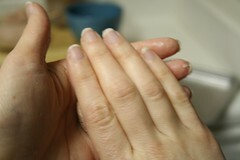 Add salt and pepper, then adjust to taste. 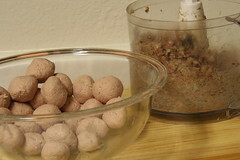 Divide and shape the shell into into 60 or more balls of equal size. 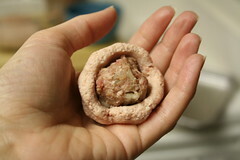 Hollow out the balls of shell, creating pockets for the filling. Tuck a teaspoon of filling into each shell and close smoothly. 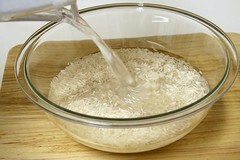 Drop into boiling sauce of your choice and cook until kubba rise to the top, then at least 5 minutes more. Avoid over-boiling kubba so they don't break apart in the sauce. *Purchase in Middle Eastern markets. 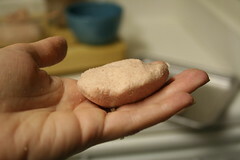 Can be substituted for a mixture of cumin, allspice and cloves. ooooh--this is a good one. definitely going to try it! What kind of sauce would you cook these in? Hi Kathy! Kubba can be cooked in lots of different sauces, but my family's favorite is Kubba Yachni, (I wrote about it on this site; check it out!). It's a mild chick pea and lamb broth flavored with onions, salt & pepper. It's pretty simple, and is best described as Iraqi comfort food. And if you're not crazy about lamb, homemade chicken stock is an ok substitute for lamb. Another possibility would be a sour sauce (kubba hamuth) made with turnips, tomato sauce and onions, then garnished with dried mint. There are lots of sauces, but Yachni is our favorite! Hi Anonymous! Thanks for your message...hopefully it will motivate me to better learn the kubba hamuth recipe, so I can post it here someday. We're so in love with kubba yachni, you see. :o) But there really are so many great ways to eat these! Ok...if anyone is out there...I posted kubba hamuth. This is our way; I know there are many others. See whatcha think! I was wondering if you've tried these deep fried? From what I can remember my momma uses the same recipe but its fried. Probably not as healthy, but so delicious. I haven't had them deep fried when made with this recipe, but I have enjoyed many deep fried kibbe made with bulghar instead of rice. Did your mom make hers with rice or bulghar? Thanks for commenting, and thanks for visiting! Great tutorial! I would like to try this. I usually just buy the frozen kind of kubba, either the flatter kind or this rice kind. 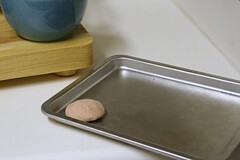 Do you make Iraqi bread? Would love to learn that! We usually just eat pita from the Middle Eastern Bakery...bread seems like such a high hurdle to clear! Thanks for reading, and I hope you try the kubba!